IDS Astra G2 RV and Marine dealer management software provides many ‘time savers’ designed to improve workflow and save you time and effort. Most depend on ‘context’ – options available based on which window, which tab, and which field you’re in. Whenever a field requires a search of your dealership’s database, you can launch a search by double-clicking in the field. Right-clicking in the field lets you choose from available search options. (In this example, right-clicking in the Stock No. field launches a Stock Search). Most fields that allow input are also ‘activated’ via a right-click. (In this example, right-clicking in the Dealer Option Code field provides access to an Option Chooser for easy lookup). 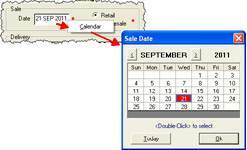 You can also enter a ‘short form’ date – enter the month and date separated by a period (. ), and Astra G2 will ‘translate’ the date to DD/MM/YY format, with the current year assumed. For example, entering ‘4.15’ in a Date field will result in the date being entered in to Astra G2 as ‘15 Apr 2011’.